I love technology and the ability that global connections are easier to make today. 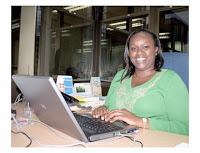 The article here, in the Business Daily Africa announces the Anita Borg Change Agent Award going to Dorcas Muthoni, who is the general manager of OpenWorld. She receives the award because of her 3 year investment getting more girls and young women interested in Information Communication Technology (ICT). They talk of the challenges that girls face when they don't know the breadth of what ICT includes before they reject it as a career path. To solve this problem doesn't just involve reaching out to the individuals but also the career counsellors (often teachers) to provide the right encouragement based on the right knowledge, instead of steering women away to more typical careers. Another woman talks about her motivation to be involved in outreach programs to pull more women into ICT - she had experienced too many times being in a room of men at events and the assumption being she was the event organizer. The article contrasts the outcome of not participating in outreach programs with the world that could exist if the right mentoring is provided at the right times. On days I'm exhausted, I read articles like this and it makes me find extra breathe to keep going and making it better for the next generation.